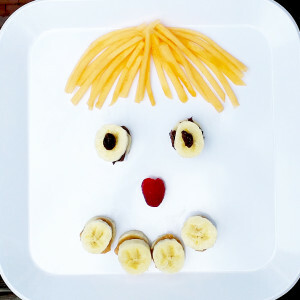 Hope you’re having as much fun with the kids snacks this week as we are! I have found that if I just cut up bananas and put peanut butter next to them on a spoon, it just doesn’t look as appetizing as a fun presentation. How many times have you gone to the restaurant and saw a waiter walk by with a creatively put together dish, and said “oh I want that!” Your kids will appreciate extra effort and creativity. Before you know it, they’ll be helping you come up with new designs on the plate. 2. Slice bananas. “Connect” 2 pieces of banana with peanut butter or Nutella.